Not only is Georgia one of the most electric-car-friendly states in the U.S., it's also the latest place where dealers are trying to block Tesla Motors from selling cars directly to consumers. The Georgia Automobile Dealers Association filed a complaint Friday with that state's Department of Revenue charging that the automaker is illegally selling cars. The dealers say Tesla is in violation of a state law which allows for sales of up to 150 vehicles at automaker-owned stores. Tesla has sold 173 cars at its one store -- opened a year ago -- in suburban Atlanta, according to the filing. "There's real demand for electric cars in Georgia. All we're asking is that Tesla sell cars in compliance with the law," said Derrick Dickey, spokesman for the dealers group. A spokesman for the Georgia Department of Revenue said the complaint is under review. Electric vehicles are very popular in Georgia, and especially in Atlanta, a city known for long commutes and awful traffic. It's also one of the few states offering a tax credit to encourage drivers to buy alternative fuel vehicles, paying buyers of the Tesla Model S up to $5,000. A base Tesla Model S costs about $71,000, without incentives. Data from IHS Automotive shows that Atlanta has the second-highest percentage of new electric car registrations in the U.S., trailing only Tesla's home market: the San Francisco Bay Area. Tesla has been battling with dealer organizations nationwide over its rights to sell cars directly to shoppers. Most states require carmakers to use independently-owned dealership networks to sell their cars, but in some states there are loopholes that allow Tesla-owned stores to operate. Tesla argues that it needs to be able to sell directly to customers because company-owned stores have sales people who are familiar with the advantages of electric cars and who are motivated to sell them. Dealership groups argue that having independent dealers sell the cars provides a level of protection to car buyers that's unmatched in company-owned stores. To date, Tesla is barred from selling directly to consumers in four states - New Jersey, Maryland, Texas and Arizona. In those states, buyers can go into showrooms known as "galleries" to look at cars -- but they can't complete the sales. In these states customers have to buy the cars online or by phone and have the car shipped to them by Tesla. 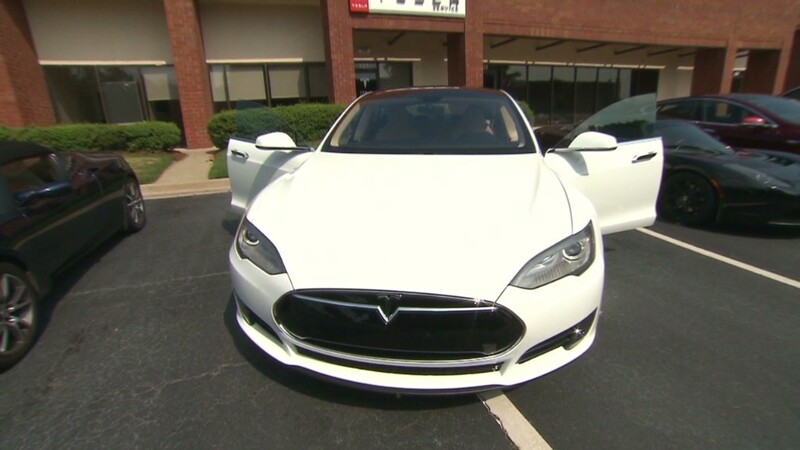 Tesla said it is in compliance with Georgia laws. "The petition filed by the Georgia Automobile Dealers Association is nothing more than a thinly veiled attempt to stifle new innovation and eliminate consumer choice," said a statement from the company. "As with similar battles in other states, Tesla will use all means necessary to defend itself and the rights of consumers." Despite these hurdles, Tesla has been growing in the U.S. and overseas. Shares were upgraded to "buy" Tuesday by Stifel, Nicolaus & Co. after the company reached a deal last week to have 150 charging stations added in China, its newest market. Tesla (TSLA) stock rose 5%, Tuesday and is up nearly 90% this year, hitting a record high.